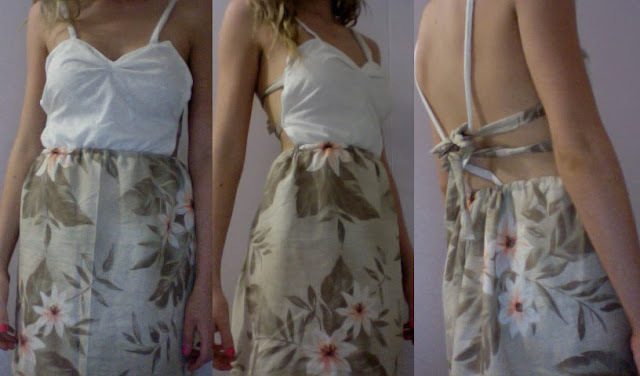 Here is a photo of the dress that I made today. All day I was restless and bored and unsure how to amuse myself. I then decided to peek into my mother's sewing cabinet only to find this cute green/brown vintage material sitting there unused... Originally it was meant to be a pinafore where a bandeau could be worn underneath. As I begin sewing and finished the top part, however, it looked much cuter to be more fitted to the body. When I had finished the dress, it still didn't look right..so I decided to cinch the bust area so it didn't gape as much. Here is the end product. It still needs some fixing up, but I will get onto that another day.